Book with Champion Charter Bus for easy and efficient travel arrangements in Denver. No matter what event brings your group to the city, we’ll make sure no one ends up lost with organized transportation for everyone. No matter what kind of trip you’re planning, Champion Charter Bus has the expertise to help you. From weddings and corporate events to school field trips and sports trips, we can make planning a group trip easy and fun again! Our team is ready 24/7 to go over trip details and help you find your perfect bus rental! Call us any time at 303-482-2792 to receive a free, no-obligation quote! Champion Charter Bus provides simple and efficient coach bus rental booking experiences to all Denver travelers, no matter the occasion. Event planners, school administrators, and sports team managers trust us to find the perfect coach for their travels-- find out for yourself what sets us apart by giving us a call for your next Denver group trip! Our bus network includes vehicles of all sizes, from spacious full-sized charter buses to compact minibuses and all sizes in between. We can easily accommodate groups of all types, whether your travels extend down the street or to another state. Worried about keeping your group entertained on the road? We’ll find a bus with WiFi, DVD players, television screens, and power outlets to ensure that everyone can enjoy their trip from beginning to end. Our 24-hour staff is always available to help plan your trip and find the perfect vehicle for you. 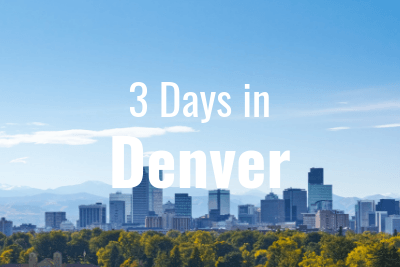 Let us streamline your transportation so you can put your attention towards having a great trip to beautiful Denver! Call us today at 303-482-2792 to get started. Whether you’re in town with friends or family, Champion Charter Bus is your go-to for convenient, simple transportation. Enjoy the best of Denver without the hassles of finding attractions on your own, dealing with traffic, and parking. When you choose to work with us, we’ll handle everything so you can get the best Denver experience possible. Plan a personalized itinerary with attractions you want to see on your time. Explore the Denver Zoo, be amazed at the Downtown Aquarium, or stroll through the Denver Botanic Gardens--whatever you want to see, Champion Charter Bus will make sure you get there with efficient, easy group transportation. Explore 80 acres of wildlife just inside the City Park of Denver. Notable exhibits include the Toyota Elephant Passage, Northern Shores, Pachyderm Habitat, and the Bear Mountain exhibit. With over 5,000 species to explore, the Downtown Aquarium is a state-of-the-art aquarium that features a restaurant and lounge area. Located in the Cheesman Park neighborhood, the gardens feature 23 acres of beautiful gardens and an amphitheater that hosts a variety of concerts. This iconic amphitheater is a rock structure just 10 miles outside of Denver, hosting various concerts in the open Colorado air. Located in the Recreation District of Federal Heights, you can ride Colorado’s first two water slides at Water World. 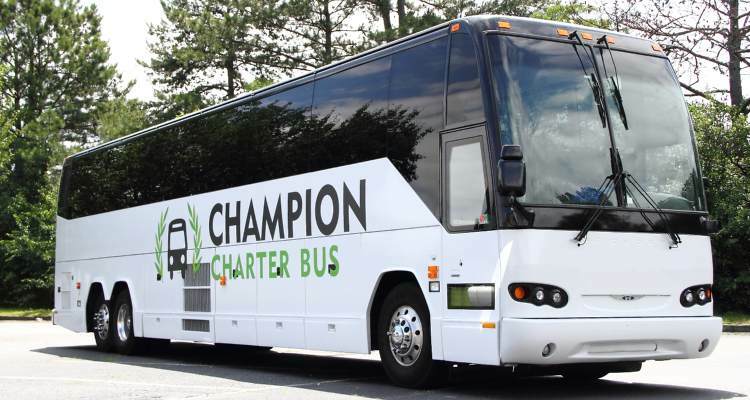 Champion Charter Bus supports champions on the field with Denver’s top motorcoach rentals. Whether you’re a coach, an athlete, or just a dedicated fan, we have what it takes to handle your group transportation. Ensure your entire team is fully prepared for the big game with a comfortable ride. Everyone will feel ready to win with the comfort of reclining seats, air conditioning, restrooms, and more. With storage bays available underneath the bus and overhead bins above seats, you’ll have plenty of room for all your sporting equipment and luggage. When cheering on the Broncos, Nuggets, Rockies, or any other local team, it’s understandable to feel stressed about the transportation. Facing gameday traffic and paying for overpriced parking can easily affect the experience, but with a charter bus rental, you can leave that all to us. Get pumped up, drink on the bus, and get straight to the game while we handle the rest. The home of the Colorado Rockies, you can plan the perfect day of America’s favorite sport here. Previously known as Invesco Field at Mile High, this is where you can cheer on the Denver Broncos and Denver Outlaws. This arena is home to the Denver Nuggets of the NBA and the Colorado Avalanche of the NHL, making it super versatile for all sports fans. Your attendees can either make or break your event, and when they arrive late or not at all, your schedule can easily get off track. Champion Charter Bus works with event planners for all types of events for streamlined transportation to ensure everyone arrives together and on time. When heading to the Colorado Convention Center, employees can get lost or arrive late due to public transportation, rideshare apps, and other outside factors. We can arrange for bus transportation to pick employees and clients up at your headquarters and transport them to your conference, trade show, off-site meeting, or other corporate event. Your motorcoach can also offer the convenience of WiFi and power outlets so everyone can continue to work while on the road. With 2,200,000 square feet of space, the Colorado Convention Center is the perfect venue to throw any kind of event, especially corporate events. Plan a smaller corporate event here for your company! This venue offers plenty of meeting rooms at an affordable price. Located in snazzy downtown Denver, this venue offers comfortable meeting spaces in a beautiful, urban environment. Make sure wedding guests have a safe, reliable ride to and from your wedding at your gorgeous venue like Parkside Mansion. Because Champion Charter Bus has experience organizing group transportation for engagement parties, bachelor and bachelorette parties, bridal shower, and other wedding events, we can ease the stress of wedding planning with modern bus rentals. This venue offers you a “blank slate,” giving you the opportunity to work with a designer to create your dream wedding. Built in 1902, this historic venue is the perfect place to fall in love all over again and start the next chapter of your life. Are you a modern couple? The Space Gallery is your venue then. This spacious art gallery features open spaces with natural lighting, paintings, sculptures, and more. Whether you’re going somewhere far or down the road, reliable and safe transportation is important for students, faculty, and chaperones. Champion Charter Bus is dedicated to providing trustworthy charter bus rentals, and we only work with licensed, professional drivers that meet our standards. Ride with your students to the Denver Museum of Nature and Science in complete comfort. Unlike a traditional school bus, a motorcoach rental can offer amenities like on-board restrooms, TVs, DVD players, air conditioning, and more that can help enhance your trip experience. Have any special requests? Your reservation agent will work hard to meet your requirements. Ready to explore outside of Denver? Let Champion Charter Bus take you to Las Vegas, Phoenix, Los Angeles, San Diego, San Francisco, and more while you focus on your trip. Bond with your group and enjoy your free time while we handle the rest. Champion Charter Bus Denver can help you make bus transportation easier than ever. With our 24/7 team and extensive network of bus rentals, we’re sure to find you the perfect bus. Call us any time at 303-339-0106 to get started. 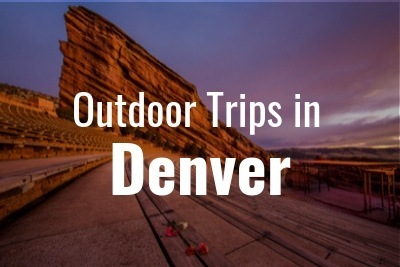 Explore the beautiful Denver outdoors with Champion Charter Bus! 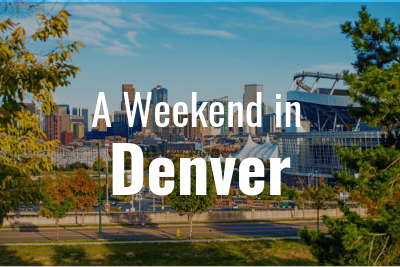 Easily plan your next weekend in the Mile High City. Discover the best of Denver Attractions By Bus!